Inder Loves Folk Art: Me Made May 2017. Well, I did it again, folks! I participated in Me Made May and posted pictures of my outfits (with at least one item I made myself every day, and multiples on many days) on Instagram every day in May. Some of these pictures included beverages (coffee, smoothies, and IPA). Others included stuffed animals when dictated by Joe or Maggie or photo-bombing kids and husbands. Taking daily selfies definitely gets tedious - a good sense of humor really helps! I'm not going to get too navel-gazing about this process, but I do have some observations. Prints vs. Solids. Styles have changed a bit in the past couple years, and my many printed t-shirts and blouses are starting to feel dated (in addition to worn to shreds). I find myself wanting to wear solid colors (or stripes) more. Maybe it has to do with the sedate (depressed?) mood our country (and world) is in right now, or maybe it's the influence of the many capsule wardrobes the sewing bloggers have been working on lately, but I seem to be embracing the all neutrals minimalist trend. (Let's just pause for a moment to reflect: I have been sewing for myself long enough that some of my me-mades feel outdated!? Yay, me!) Some of my most-worn items this month were the new cream Hemlock tee I just made, my black herringbone Pleated Pencil Skirt, my beloved black and cream striped Mabel, and my cream sleeveless Archer. I have several more neutral or semi-neutral items in the pike. I'll probably look back on this two years from now and think "BORING," but right now, it's what I'm enjoying, you know? Mustard Yellow. And yet. I made a mustard yellow Mabel Skirt and sleeveless Hemlock tee this month, which I hope to blog soon. I'm taking the position that mustard yellow (or "golden," as my kids call it) is a neutral. Business Wear. I wore suits or at least a blazer frequently this past month. With greater responsibilities at work come more formal meeting situations, which means wearing a suit more (blah, I'm not a fan). I knew going into this May that I didn't have enough simple blouses to wear with suits, and in fact that was the biggest struggle. Because I have a large bust, I have historically favored a loose drapey shell under blazers rather than a button-down shirt. The Maya Top is probably my favorite top to wear with suits, although I'd like to branch out a little bit. Recently, I've been noticing some Josephines with released pleats or pleats converted to gathers that look really pretty, and I am considering making one in a very drapey (solid, neutral) fabric. On the other hand, I really like the way my cream Archer shirt looks with suits, and one of the advantages of sewing for yourself is that you can avoid gaping or too-tight button downs. Sewing up more button down blouses to wear with suits is also on my list. Casual Wear. I'm doing pretty well with me-made casual weekend clothing. I love my t-shirts and sweatshirts to death. One issue I noticed this month is that I like to sew casual skirts that I don't wear very much, because they aren't formal enough for work, but nor are they ridiculously comfortable and easy to wear, which is a requirement for weekends. Here, I'm talking about my Moss Skirt and Brumby Skirt. I love both these skirts, and I do wear them, but not as much as I would if they were either more work appropriate or more appropriate for actual house and gardening work. For someone else, these would be wardrobe workhorses, but they languish in my closet. On the other hand, t-shirts, and anything with an elastic waist gets worn to death. Lesson? I guess I should embrace my Fred Rogers-esque costume changes and make more pencil skirts and work-appropriate blouses, as well as more t-shirts and elastic waist pants, and less "middle ground" items. I still don't wear dresses. I mean, hardly ever. And that's okay. I have a uniform, and it works for me. Separates FOREVER! I'm eyeing my Alder Dress, thinking I might convert it into a blouse. Stay tuned. Simple shapes. I do want to keep trying new techniques and more challenging makes, but it should be noted that my most worn me-mades are very simple shapes. These aren't always the most exciting things to sew, but are so very versatile and practical! The best thing about May Me Made this year was how inspired I was to sew some more clothes for myself! My feed was SUPER INSPIRING, I started following a bunch of new-to-me IG feeds, and I sewed no less than four tops and one skirt this month (and made good progress on a button-down shirt), which is more selfish-sewing than I've done in a year! 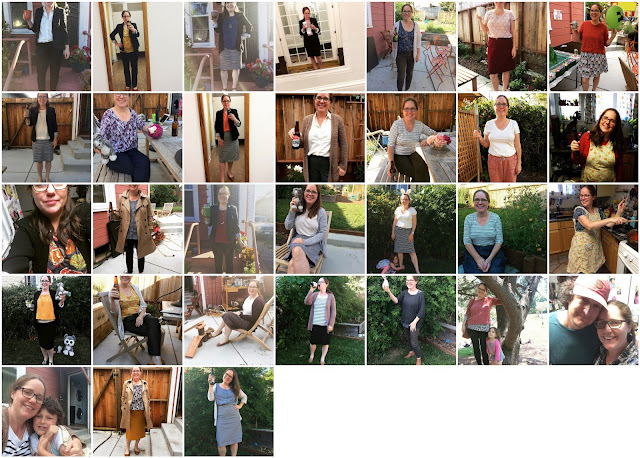 A huge part of that was the excitement and camaraderie of seeing what all of my sewing friends were wearing this month. To all of you who participated in MMMay17 or liked or commented on my posts this past month - THANK YOU! Did you participate in Me Made May? Any big takeaway lessons? You will always be my inspiration for skirt sewing! I love your Mabels and the denim Brumby. You have a great wardrobe! Thank you Katy!!! I love sewing skirts, and my Mabels are some of my most worn me-mades. It's funny how sometimes it's the most simple basic patterns that get the most use! Your outfits were great! I really got into solids this year too; I think it's definitely due to all the minimalist capsule wardrobes I've been seeing. I am planning another sleeveless release-tuck Josephine to replace one that fell apart, rayon is the way to go but I hate doing the bias finish in it so I may draft facings instead. I think you'd get a lot of use out of one! You always rock MMM. I noticed your blazers and they look fantastic on you! Can't wait for you to blog about your new makes, especially the new shirt you've been working on with the Liberty trim. All the heart eyes. Maybe you can start sewing for me, too. You know, in all of your free time. ;P (Obviously joking!) But you are amazing! I love your commitment to MMM17, I gave up, too bored but the half month I did was helpful. I culled 3 pairs of very expensive but not right for me shoes (donated) and could critically see I need a new bra (or two) and some smaller tee's. Oh, I need to learn to knit. May I suggest Lekala? I want to try their blouse but don't need any however the patterns have all been excellent for my other girls. Congrats Inder, you should feel very proud. Thank you, Nicole! I have to say, I had never heard of Lekala, but your makes and reviews have been most intriguing! So many great patterns, so little time! I enjoyed following along on your Me Made adventures. Makes me want to try some selfish sewing sometime! I've decided any color can be a neutral if you just believe it in your heart. ;) I have a particular affinity for red and teal shoes, for instance. Funny you mention dresses. I had that same conversation with myself awhile back, and then wouldn't you know it — this summer I keep reaching for the couple dresses I saved out! Turns out they're comfy (sans hose, natch). Who knew.